The PSDS source can be used for many EMC applications and problems because of its repeatability, accuracy, physical size and electrical isolation. Because of the repeatability (0.2 - 0.5 dB) of output power settings, the PSDS is ideal as a calibrated reference source for OATS, GTEMs, anechoic or shielded rooms, or any RF test environment. The PSDS can be used as an inter-laboratory and/or a multiple site transfer standard. Because of its relatively small size, the PSDS is ideal as a source to be placed inside an enclosure for shielding effectiveness measurements. The dipole gap voltage monitored within the sphere (source) is fed back via an optical fiber cable to the control unit. This gap voltage is then displayed on the front panel. If antenna loading is observed (decrease in gap voltage due to the close proximity of the enclosure walls to the antennas) then the RF input power can be increased until the gap voltage is returned to the reference setting. 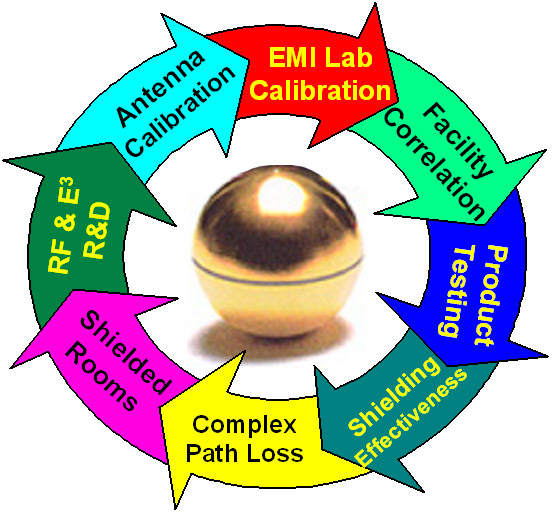 This insures the same radiating source electric field as in the open calibration characterization. The PSDS is very repeatable, so that the same electric field can be created whenever desired (0.2 - 0.5 dB of output power settings). The source is physically small so that it will resemble a "point source", and so its physical size is not a concern during antenna calibration. The PSDS is physically repeatable so that once the source is in position with the fiber optic couplings, there will be no effect from the coaxial cables, power cables, ground loops, or metal walls.